Our latest edition of multi-camera switcher software Live:Air Action is now available for download on the App Store! With its release this week, we wanted to give you a quick rundown of how the app works, along with how it was used at a small, local event to switch between multiple cameras and stream to 3 different video platforms simultaneously. First, let’s look at the main features of Live:Air Action. 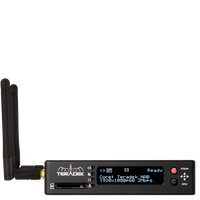 Available for iPads, Live:Air Action connects up to 6 cameras feeds together for mixing, which you can either use iOS devices (iPhones, iPads & iPod Touches) as camera sources or video cameras linked with Teradek encoders as camera sources. When you connect all the devices to the same WiFi network that Live:Air Action is on, the app picks up the camera sources and populates them on the camera select screen, which you can choose for live editing and switching. Live:Air Action allows you to connect up to 6 iOS devices and/or video cameras connected with Teradek encoders. Once the feeds are in, you can choose from a set of built-in graphics, overlays, transitions and much more to mix into the broadcast. You can even load in your own pre-made graphics and gifs ahead of time and have them ready in the app for broadcast. When you’re ready to go live, simply choose from a list of built-in live streaming platforms (YouTube, Twitch, Facebook etc. ), Core, or custom RTMP and you’re all set! We set up 3 cameras in different spots all pointed to the stage. 2 Canon HF-G20s on Manfrotto tripods were placed on both sides in front of the stage to capture close-up shots, while a Canon XA-10 was placed on a Redrock One Man Crew further back to capture the cover shot. Each camera was connected to its own VidiU Pro encoder, which were all connected to the same WIFi network provided by a Link. This allowed our Live:Air Action app to automatically detect the 3 camera feeds and populate them in the app’s control surface. When the concert began, we had two crewmembers controlling pan & tilt of the two front cameras, while the back camera rotated left and right automatically from the One Man Crew. These feeds were sent to our switching operator’s Live:Air Action app, where he controlled the feed being broadcast. Live:Air Action app switching between 3 camera feeds. Using the Internet connection provided by a Node USB modem with a T-Mobile SIM (connected to the Link), the feed was sent from Live:Air Action directly to our Core management account. From Core, the feed was broadcasted to 4 separate video platforms: 1 Facebook Page, 1 Periscope Channel and 2 YouTube Channels. With the Node providing 26 Mbps to our Live:Air Action app, the stream from Live:Air Action fed Core perfectly. Using this collection of live streaming solutions, we were able to achieve a superb low-cost HD multi-camera broadcast without needing enterprise-grade production equipment of traditional large workflows. At the same time, simulcasting with Core meant the event was able to reach 4x the audience of a normal, single-destination stream without needing additional bandwidth or hardware. As software becomes increasingly versatile in all forms of video production, Live:Air Action serves as an affordable alternative to traditional multi-camera solutions, giving both small and large events the right resources to produce live shows exciting and professional for viewers. Check out our new Live:Air Action page and start broadcasting today!